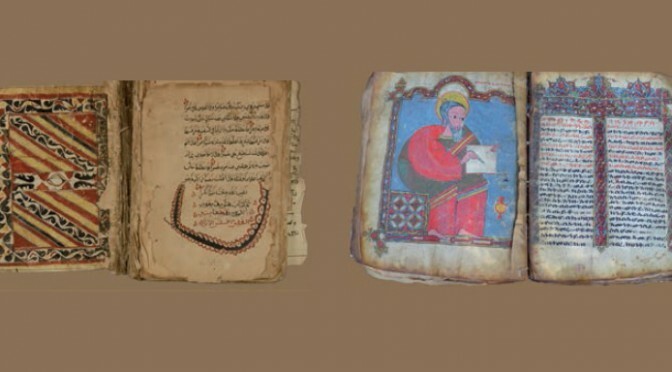 Since the middle of the first millennium of our era, Ethiopia has seen the development of two manuscript book cultures which seem to have evolved separately, on geopolitical territories for a long time distinct, in the service of different religions and administrations. These Christian and Islamic manuscript cultures also developed in various languages and scripts which have compartmentalised research on the subject. If the historiography of Christian manuscripts is already well rooted, Islamic manuscripts whether in Arabic languages and script or local languages and Arabic script (‘ağamī) up till now have been little studied. However, research today into Ethiopian manuscripts as Islamic and Christian renews the questions as to the points of contact between the histories of these books: whether they were produced in Ethiopia, or whether they are to be sought in the exchanges between Ethiopia and neighbouring countries, such as Egypt, Sudan and the more distant West Africa, or even further East, in Yemen or India, as they left their mark in the texts or in the different aspects of manuscript books. One could also investigate the links with other traditions and manuscript practices which existed in the same area. The contributions should study the connections between the different manuscript book cultures of Ethiopia not only taken into consideration as texts, knowledge and traditions which they conserve and convey, but above all as objects having different characteristics and a matter of specific know-how. The papers could explore different periods of history of these books but emphasising the points which permit a comparative reflection on the production, function and use of these books. This call for contributions results from the international workshop « Christian and Islamic Manuscripts of Ethiopia (12th-20th century): A Comparative Approach », organised by Claire Bosc-Tiessé (Institut des Mondes Africains) et Anne Regourd (Unit “Proche-Orient – Caucase : langues, archéologie, cultures”) held on 13 and 14 December 2014 at the French National Library. Proposals for an article (including the working title and a summary, about 500 words) should be sent to claire.bosc-tiesse@univ-paris1.fr before 30 April 2016. The definitive version of the article corresponding to the proposal retained should be ready before 1 November 2016.